Sillette Sonic Cat Lifting Drive Leg, New 2016. Roller reef and new forestay installed 2012 . Solid fuel Newport heater installed 2007. It’s difficult to find a fault with this Prout Quest 33 CS, don’t get me wrong, it’s not new, but it has all the hall marks of being well maintained and much loved. With numerous upgrades including a new engine in 2004, including a very good compliment of navigation equipment and a cockpit tent (conservatory) from which she can be sailed in adverse weather. Every where I looked it was clean and in good order. If you are looking at this boat then you have probably decided that you are considering a catamaran, offering very spacious accommodation, and lots of stowage. I don’t think you would be disappointed if you came to view her. 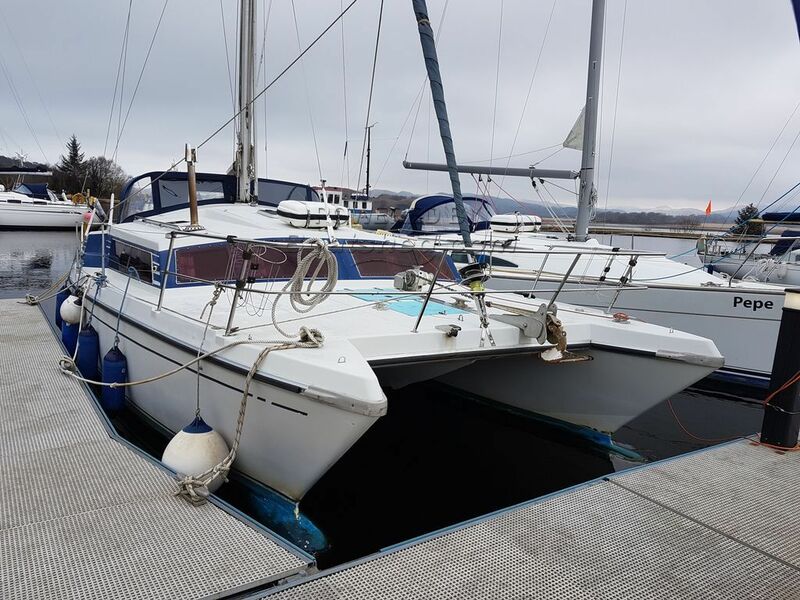 This Prout Quest 33 CS has been personally photographed and viewed by Ian Sawkins of Boatshed Scotland. Click here for contact details.